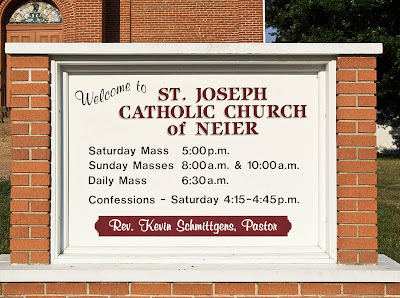 HERE ARE PHOTOS of Saint Joseph Church, in Neier, Missouri. 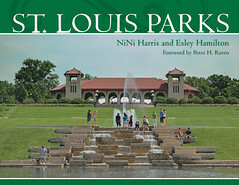 The unincorporated community of Neier is in rural Franklin County and is about 9-½ highway miles southwest of Union, Missouri, and about 59 highway miles west of downtown Saint Louis. 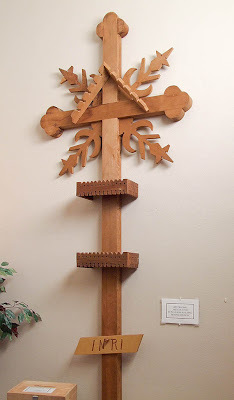 I've seen several of these wooden crosses in the Archdiocese. They look like something that would be found in Bavaria. 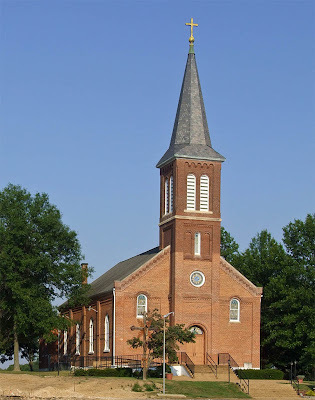 This church was originally a German-language parish. 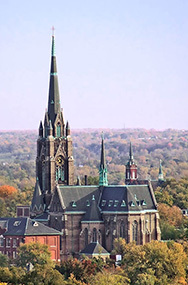 It was completed in 1899 with the construction of the bell tower. 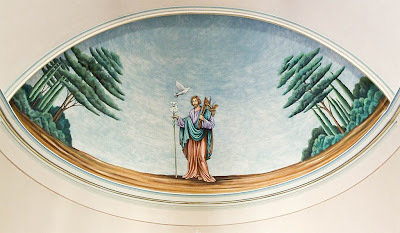 Saint Joseph painted in the dome of the apse. Joseph holds lilies and carpenter tools. 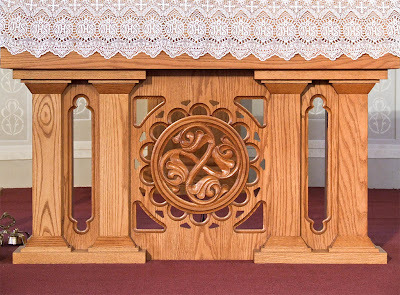 Carving on the altar-table. It appears as though it was blazingly bright in this church; but rather it was in near darkness. These photos were taken with a tripod and long exposure times. 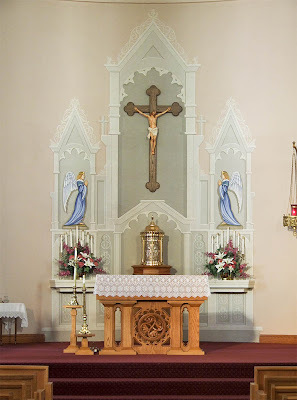 The Holy Family is to the left of the altar. 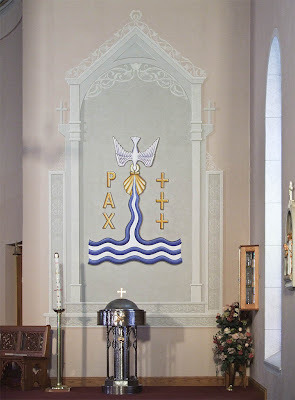 Pax, peace, and the baptismal font to the right of the altar. 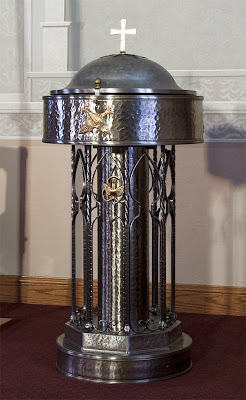 The baptismal font is of unusual design and is made of a bluish metal. 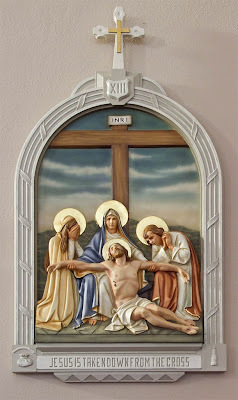 The XIIIth Station of the Cross: "Consider how, after Our Lord had died, He was taken down from the cross by two of His disciples, Joseph and Nicodemus, and placed in the arms of His afflicted Mother. She received Him with unutterable tenderness and pressed Him close to her bosom." The stained glass windows here are mainly of this general design; the Lamb of God is at the top. 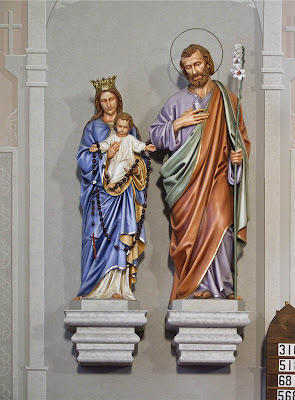 Icons of Jesus and Mary. Above the choir loft. Which Saint could this be? 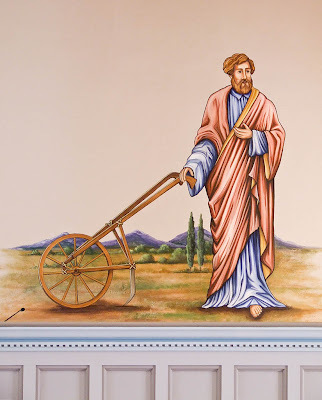 With a plow, I would have guessed Saint Isidore the Farmer, but here he is wearing ancient robes. 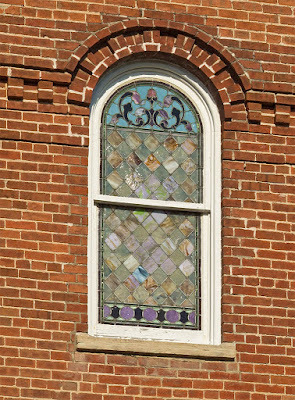 Window over the front door. 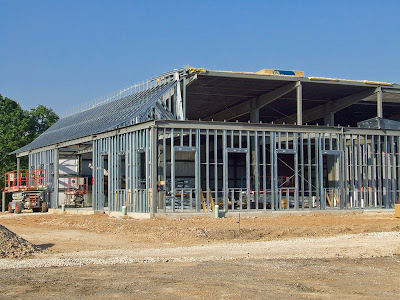 A new outbuilding under construction next to the church. 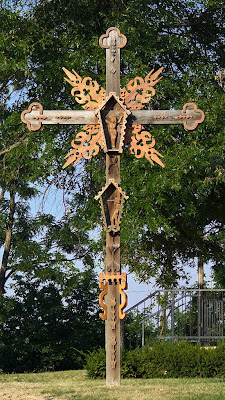 The carved cross was probably done by the late Father Anthony Bukarus (I'm not sure if the spelling of his last name is correct). He was from Lithuania and lived in Franklin County for a long time. I agree -- it was probably Fr. Tony Backauskus. He used to make those in his shop. My parents have a smaller version of one like this in their house. 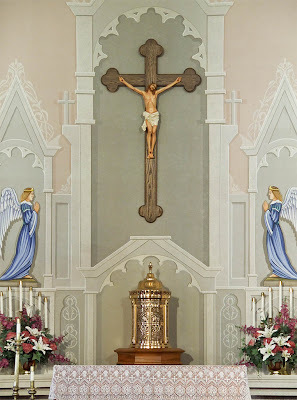 The cross was created by Father Anthony Bukauskas. Father Bukauskas was born in Boblaukis, and educated in Lithuania, Germany. 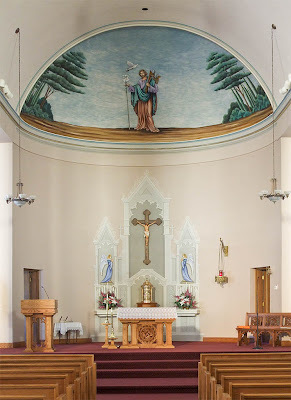 He completed his Theological studies and was ordained as a priest in Eichstatt, Bavaria. 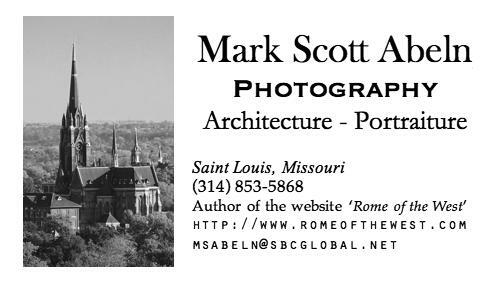 He came to the United States in 1949 and was a priest and teacher at St. Francis de Sales in St. Louis, MO. 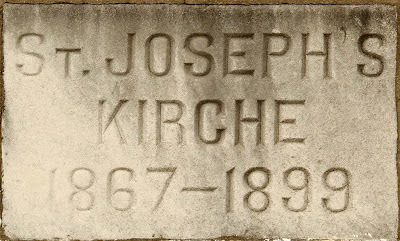 He was appointed Pastor of St. Joseph Church of Neier, MO in 1964. 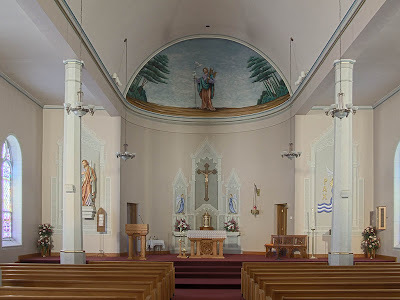 In addition to his Priestly duties, in 1970 Father Bukauskas became a visiting artist at the East Central Jr. College Union, MO and begain teaching Painting 1 and Painting 2. In the art community Father Bukauskas was known as fab. 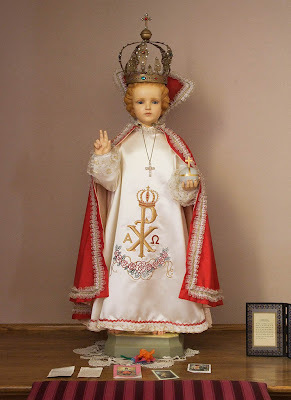 Is also could be Saint Leonard, which used that instrument to limit the area for a new church, and Blessed Sebastian of Aparicio, which taught the Indians to use it.